Where do you want to eat? On the surface it’s a simple enough question, but any person that’s been part of a relationship lasting more than two days knows it is anything but simple. What do you feel like? I don’t know, what are you craving? I picked last time, it’s your turn. We’ve all had these conversations. 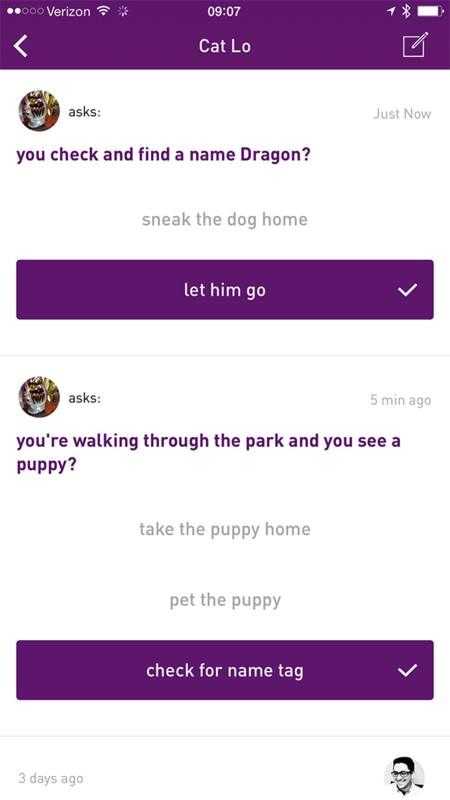 And that’s why we built Re:quest — to make it easier to get answers to the not-so-straightforward questions. It all started in mid-March with a project codenamed Timex. We began with an interest in the Apple Watch and doing something “with the Watch in mind.” None of our existing products were good fits for WatchKit, so we needed to start fresh with a new product. We kept the project small and secret to avoid doing too much. We distributed our first internal prototype after just two weeks. Since the concept was so simple, the app was fully functional from the very beginning. After another two weeks we rebuilt and redesigned the prototype for a California trip at the beginning of April. While there we explored building the app in CloudKit, and that brought about a third rebuild and redesign. Turns out a third time was the charm and just 45 days later, we had a completed, and approved version 1.0, ready for launch. MartianCraft has gone all-in on the Apple Watch, after purchasing watches for the entire company as our holiday gift at the end of 2014. We love our watches and we’re excited for what they bring. Fittingly, Re:quest is an app tailor-made for Apple Watch. You can compose, respond, and review everything on your Apple Watch without needing to retrieve your phone from your pocket. Everything from the question length, to the answer length limitations, was optimized for Apple Watch. The principal user interface for answering questions is the long look notification. 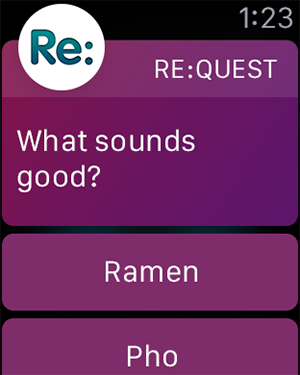 As part of the Watch notification, the user is presented with a question and three choices presented as buttons. 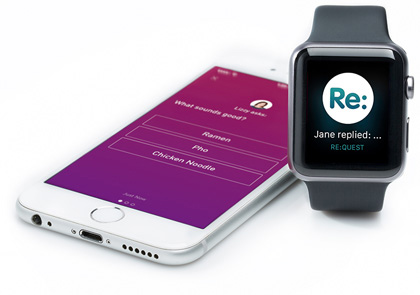 This allows the user to answer with a tap and their watch returns to the watch face. No delays or pauses waiting for an app to load. Short and sweet. It quickly became everyone’s favorite Apple Watch app around MartianCraft. 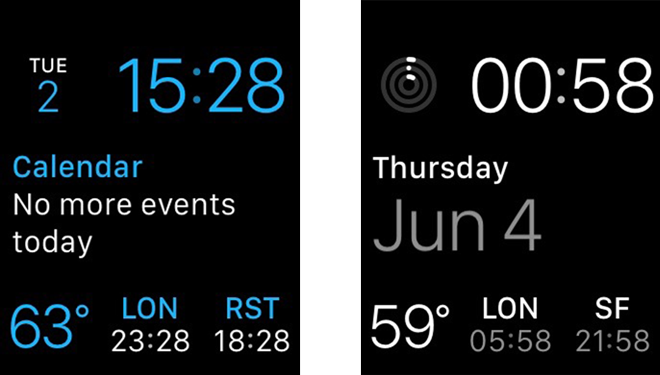 We also didn’t realize at the time that the app would be just as awesome on iOS as it is on Apple Watch. Internally we’ve seen Re:quest used to schedule meetings, to check if people are around, or even to write a choose-your-own-adventure type story. An app like Re:quest is no good if all your friends aren’t using it. So we knew from the outset we needed to make this app as inexpensive as possible for it to be the most useful. The financial factor to consider was the ongoing server costs. We needed a solution that was inexpensive, but would still scale with our audience. Additionally, we wanted to set up accounts as quickly as possible. To solve both challenges, we turned to Apple’s CloudKit framework, newly introduced in iOS 8. First, it allowed users to create their account profile, without having to create and remember another password. We simply authenticate you using your iCloud account. Better still, CloudKit allowed us to make the app free, since the server costs are so minimal and scale with the size of our user audience. Now there is no need to make you pay up front to use the app. The benefits were obvious and huge and ultimately allowed us to release Re:quest for free. There’s a lot of discussion about the best watch face, but amongst the Re:quest directors there was an obvious choice: the Modular Face. Half of our development team is in the U.K., and the other half is on the west coast of the U.S. — plus our designers are on the east coast of the U.S. Work on Re:quest rarely came to a halt. We would wake up ready for a new build and go to sleep ready for a new build. We both found our Apple Watches were perfect for keeping track of everyone’s waking hours without all of the tedious time zone math. Re:quest is live on the App Store, and a free download for everyone. We hope it saves you time, and we hope it reduces frustrating decisions. We hope you love it as much as we do. Find out more by going to the the Re:quest website or following @request_app on Twitter.